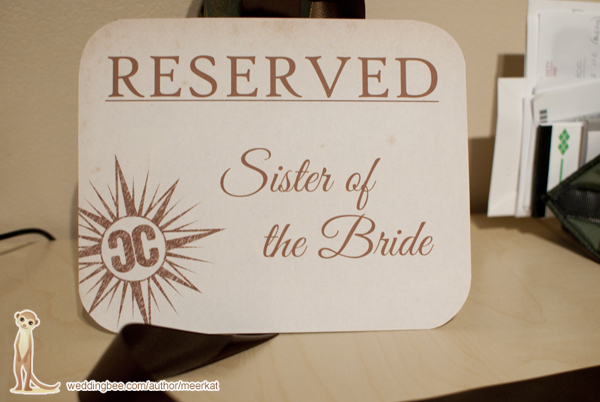 One of the last minute projects I had to finisih before we left for Mexico was reserved seating signs for the ceremony. We needed to mark the front two benches at the ceremony for our families. 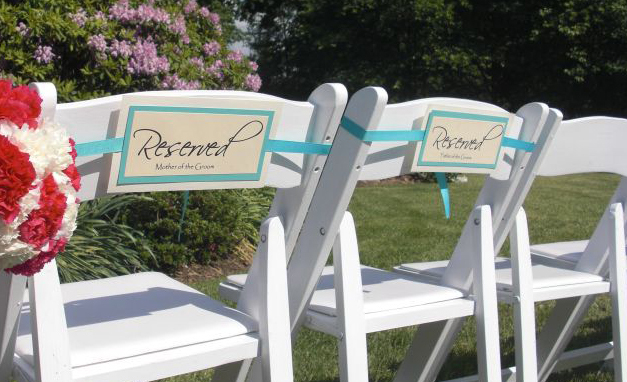 When I started researching different sign types the only examples I could find were ones that were for chairs. Not real useful for those of us using benches. Of course we could just lay them out on the benches like this but I was really afraid with the wind on the beach they would blow away. It wasn't so much the color or design that inspired me as the way it tied around the chair back. So I "borrowed" the tie idea and created signs that were more my style and colors to tie around the benches. You can do this in PowerPoint or Photoshop. It will work exactly the same way in both. First step is to add the same time worn paper background I used for our menus and the I-Spy cards. You can find it here as a free download. In brown, I typed reserved in centur font, sister of the bride in good vibrations font and then added our monogram at the bottom left. Next I traced an upside down cup to make the rounded corners and cut them out with scissors. Finally I cut four feet of brown ribbon and used the spray glue to attach the ribbon to the back of the sign. I made six signs total and the whole thing cost less than $15. The most expensive part was the can of spray adhesive which I was able to use for other projects. 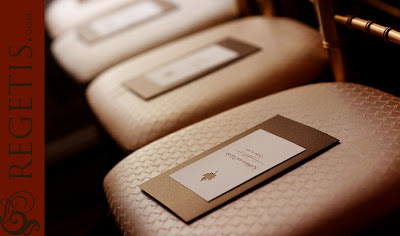 And by the way they looked totally fabulous on the dark brown wooden benches at the ceremony! 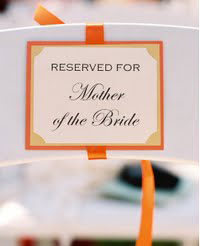 Did any of you have problems finding reserved seating signs that would work? I’m a tech-savvy tomboy from Kalamazoo, MI with an affinity for hot tea and good sushi. I love video games, board/card games, technology, robotics, movies, books, cooking, the occasional craft and our spoiled little shih-tzus. ©2010-2012 www.techsavvywife.com. All images are copyrighted to their respective owners.